A couple years ago, my Linux laptop wouldn’t connect to a customer’s projector before a sales pitch meeting we were in. Not being a Windows guy, I bought a Mac laptop, even though I was vehemently opposed to Apple and it’s high priced hardware at the time. I slowly and relentlessly fell in love with it and OSX; and it turns out that Apple does support like none other. We now model our support after the example that is Apple. A few weeks ago, a “Windows” friend of mine was commenting on my Mac laptop. I told him about the virtues, and why I am now a fan. Not “selling” Apple or the MacBook Air, but giving my honest opinion about what I’ve found coming from the other side of the tracks. His comment was “I would never buy one as I’d then have to hang out in coffee shops and wear thick rimmed glasses…” He made reference to a typical Starbucks or high end coffee shop where you see people sucking back the high-test and, seemingly more often than not – they have Mac’s in front of them. Today I’d like to take a couple of minutes to unpack the relationship between coffee lovers and Apple products. Was my friend right? I’m going to compare two years of browser stats from two different customers. One customer is a vendor of high end coffee and espresso machines for both the consumer and commercial markets. The other customer is a health care provider specifically in the area of age-in-place care for the older portions of our population. I’ve picked the first customer (the coffee machine and bean vendor) because I believe that the same types of folks which are frequenting the coffee shops of the world would be the ones looking for higher end coffee machines and speciality coffee brands. The second customer (the health services customer) was picked as they are in sharp contrast to the first customer, and they have about the same amount of traffic as the first. We want to understand if we can look at two different web store fronts and see if the people frequenting them look different in terms of at least the browsers which they use to view the associated web pages. While this isn’t a conclusive test, perhaps it gives us a glimpse of the computer/browser “tastes” of an end customer based on what they’re browsing for. 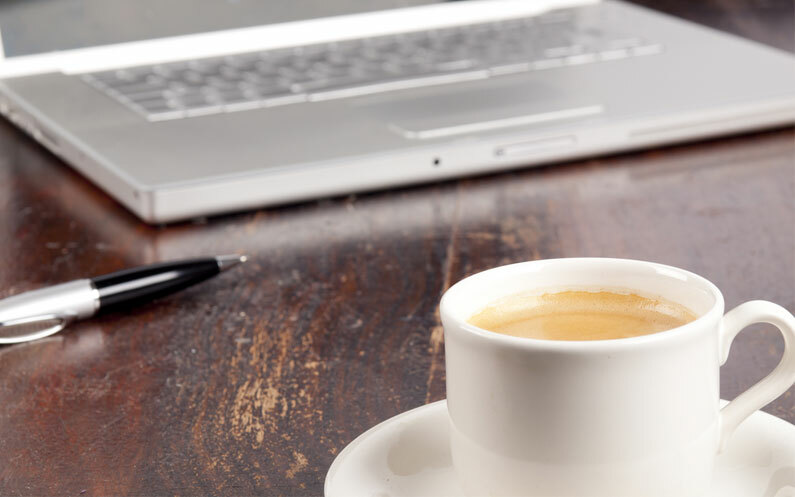 Our coffee customer has had 67,205 visits to their web site over the two year period we’re reviewing. Our health care customer has has 78,200 visits over the same time period. Safari is the browser which is installed on all Mac, iPad and iPhone products from the factory, and it is set to be the default browser (and on the IOS devices, there isn’t currently a way to change the default browser; something I thought the class action law suite against Microsoft years ago would teach Apple, but apparently not). There is also a download of the Safari browser for Windows products. Internet Explorer (IE) is the browser installed on Windows products from the factory, and it is set to be the default browser. Linux, the other desktop/laptop operating system, typically has Firefox as the default installed browser on the installation of the various distributions. With all three operating systems, you’re able to download and use other browsers. 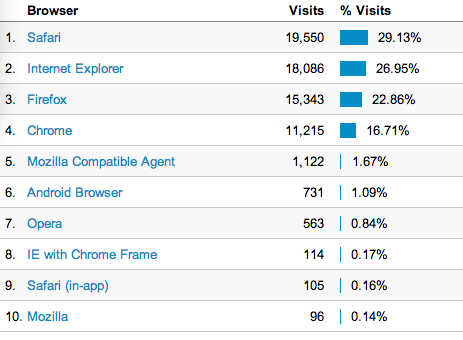 The most popular are Chrome and Firefox. Note that on Linux, Safari nor IE are available for download. 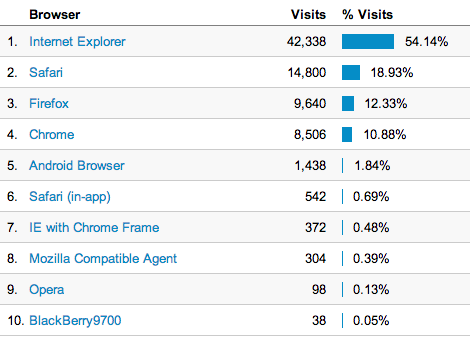 I find it fascinating to see the distributions of the browsers which are visiting these two companies. I want to be careful about the conclusions we draw from this data (a bit more on that in a later post). It is safe to say that the distribution of data for our coffee equipment company certainly has a broad spread of visits from the various browsers out there, where our health care vendor is fairly Windows centric. The coffee company has a higher raw value (and percentage) of visits coming from Safari than our health care company. From a cursory look, it certainly appears that my friend was right when he implied that Mac users like their high end coffee… Not to mention that I’m writing this while I’m sitting in a Starbucks and skewing the perceived data distribution. What data do you collect on your web site visits and your sales data? Can they be combined to tell you something more about the habits of your customers? Ask us if correlation of this data can help you figure out where to effectively place your advertising dollars, or how to find more of a certain type of customer.